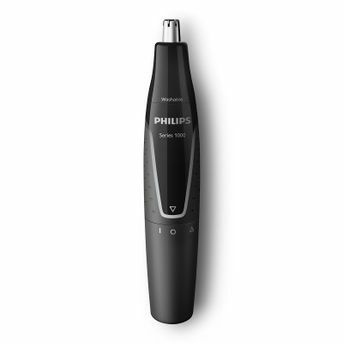 Philips NT1120/10 Nose Trimmer (Black) is the quick and easy solution to get rid of unwanted nose and ear hair. It comes with a rotary trimmer to ensure a fast and easy trim and handling is easy with the textured grip. It has rotating blades protected by a metal guard to provide a powerful yet protective trim without nicks and cuts. The trimmer is easy to clean under the tap and can be used in the shower. No need to oil ever, for easy maintenance. Its textured grip gives you great hold, even when wet, for better control when operating your trimmer. Safely removes unwanted nose and ear hair. Two Year Warranty from the date of purchase. Additional Information: Philips is a leading health technology company focused to make the world healthier and more sustainable through innovation.The brand is a world leader in home healthcare, energy efficient lighting solutions, as well as male shaving, grooming and oral healthcare products.